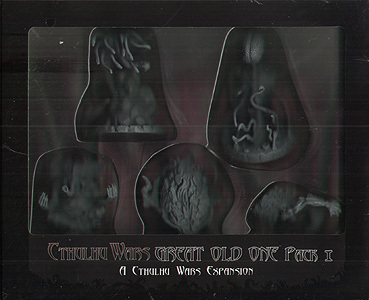 This pack contains five new Great Old One, which can be used individually or all together in your Cthulhu Wars game. At a game's start, select which Independents you want to add, and set them up by the side of the table. Each Independent comes with a loyalty card, a high-quality large figure, and a Spellbook (Abhoth comes with other counters, as well). The first player to Awaken a particular Independent takes the loyalty card, and places the figure on the map, under his control. Each Independent comes with its own unique power, plus if you can fulfill the requirement for its Spellbook, you can enhance it even more. All Independents have a large impact on the game - they are not just "extra monsters". They can change the game's victory conditions, alter fundamental interactions, or strike at enemies in new and interesting ways. ABHOTH - the source of uncleanness, Abhoth spreads its filth across the globe, enhancing his faction's defences, and polluting those of his rivals. Left unchecked, it can destroy your opponents' ability to win the game. CHAUGNAR FAUGN - the proboscidean horror from the hills, who not only provides useful defences, but changes the distribution of Elder Signs to your benefit, and your foes' chagrin. CTHUGHA - a fearsome force of destruction, Cthugha's combat strength rivals that of the mightiest Great Old Ones in battle. MOTHER HYDRA - her abilities mirror the venomous water-beast she is named for. She can use her Agony Sting to move enemies against their will, and she can spawn Cultists rapidly. Though the two are oft-associated in legend, you do not need Father Dagon to use other Hydra effectively. YIG - the Father of Serpents. He give your cultists ophidian powers, and makes the other players rue the day he was awakened. You need the Cthulhu Wars core game to use this product.